This month has been National Potty Training Month and so was the perfect time for Oxo tot to send me there 2 in 1 Go Potty to test out. Lily has only just started potty training so its very hit and miss to when she will use one, but I'm happy to say she did use the Oxo Tot Potty a few times while we have been away visiting family. So let me tell you about the potty. 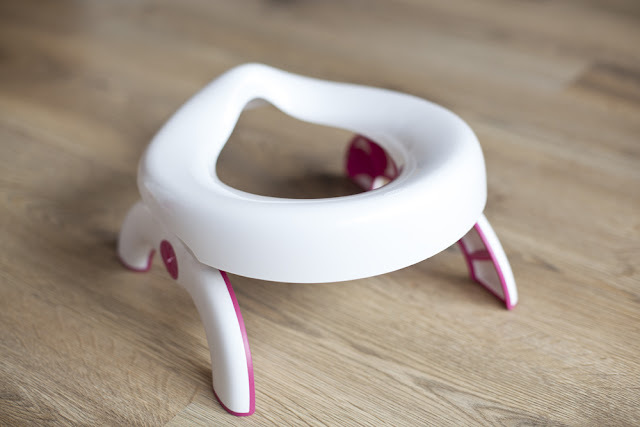 As described in the title, this potty is to be all about potty training on the go and its designed to be a lightweight, easy travel potty that can be taken anywhere with you without taking up a huge amount of space. The potty has a clever design that means it can fold down so flat and slip into a bag and lay at the bottom of the pram taking up no space. I found this so brilliant. Im always finding that my pram gets full of things I need to take with me and especially when traveling to my parents up north, and so for it to lay flat at the bottom of my pram and to take up barely any space was a huge plus for me. The potty comes with a plastic drawstring bag that you can keep it in. So a little more about how the potty works. The potty simply folds out by pressing two buttons on the legs. Its really easy to fold out and when it is up, it is really sturdy. The plastic is of a really good quality and has such a smooth finish. When the Potty is up you then attach a plastic bag to the potty and pop the sides of the bag into the holes to secure it. The plastic bags that come with it all have a liner at the bottom. The plastic of the bag is thick and nice and smooth so doesn't seem uncomfortable to sit on. 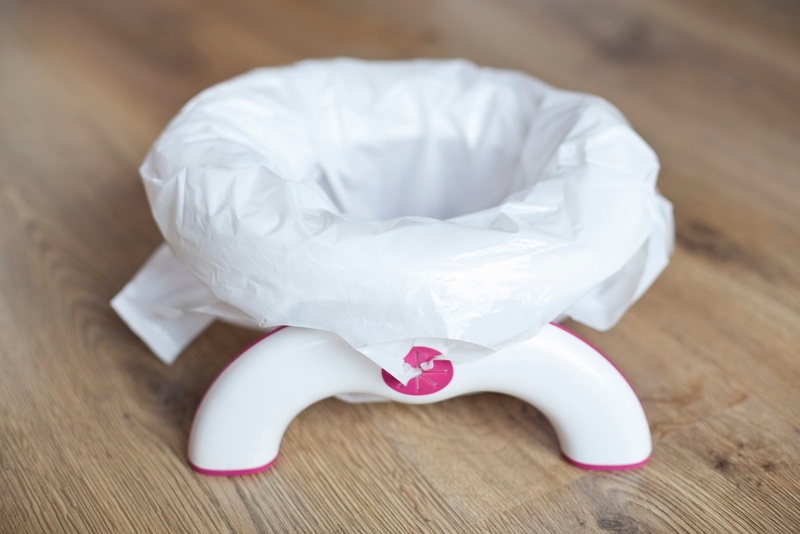 After you have used these up you can purchase more from Oxo tot or Amazon or you could plastic bags from a shop. I would probably recommend looking for bags that are of a decent plastic though, ones that are friendly to our babies bottoms. One more thing I did like about the potty was the shape of the seat. It looked so much more comfortable that normal potties that can look like they dig into the legs. I must admit Lily usually has a red mark from her usual potty but didn't get that with this seat. The seat rounds to the shape of her bottom and is a perfect little seat and Lily was perfectly happy to sit on it. I actually wish that Oxo Tot did a normal potty in the shape and design of this but with the bottom attached to it. I would happily buy one for Lily just to know she was that little more comfortable. I have one last thing to tell you about the 2 in 1 Go potty. 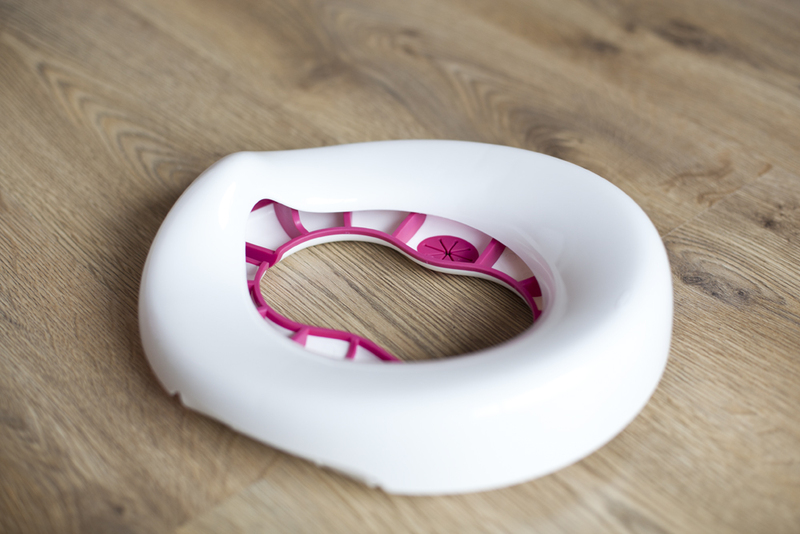 It also acts as a toilet seat for when your little one is ready to use the toilet. This could be for when at home or for when out and about as most places don't have child sized toilets. Simply press the buttons on the legs and it folds out and can be placed onto the toilet. We haven't tested this part out yet as Lily is a little young to sit on the toilet and I don't want to push her by doing something she isn't ready for. 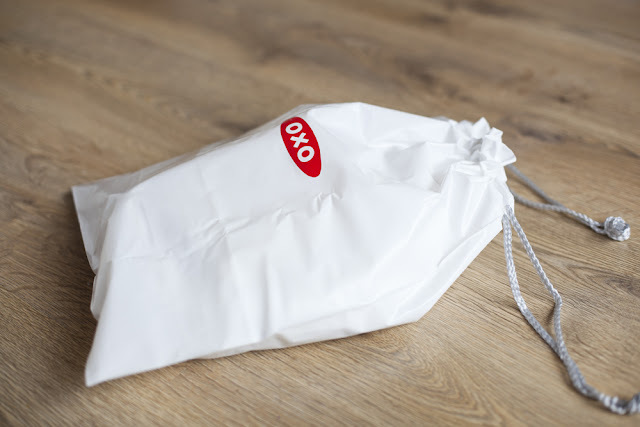 Here is a image from the Oxo Tot website that demonstrates how it can be used on the toilet. The potty is £20 and comes with the travel bag for storage and 3 plastic bags with liners. You can buy it from the Oxo tot website. I think the original price for the potty is well worth it for how handy and convenient it is, and the good quality that it is. But I think that to need to buy bags with the liners in, having to spend around £13 a time, suddenly makes the potty so much more expensive. I wouldn't let that factor stop me from buying it though, as instead I may just get my thinking cap on and shop around to see what I can find to use instead. Now, How would you like the chance to win one? I currently have a competition for a chance to win this potty. Simply head HERE and enter. What do you think about this potty? Would you buy it? A great post, these sound so handy, especially with the pad for the bag. Not too sure about the bag in it as it seems quite wasteful and expensive but looks great that it can fit on the toilet as a trainer seat. I have a square toilet bowl so wonder if it would fit on that somehow? How clever that it turns into a toilet seat when you're ready for that! Love that idea! It's been a while since I had to deal with potty training, but this looks like a great idea, especially when travelling for long distances. That is a brilliant idea, although my little boy refused the potty completely and went straight to the toilet. That looks great for potty training. Great that it doesn't take up a lot of space. This potty looks and sounds like a very handy and practical product, perfect for families on the go. I love how this is so portable and folds to a nice handy size to carry about with you. This looks handy but I agree with you about the cost of the liners. A travel potty is very useful if you have a small child and get stuck in traffic with nowhere to pull over. When my son was little (almost 30 years ago) we had a travel potty which was basically like a normal potty with a lid. After use you put the lid on & you then just emptied into the next toilet you came across and rinsed it out. However, it took up quite a bit of space so we only used it on car trips or when visiting people who did not have small children. The fold-up feature of the Oxo potty makes it more versatile. These look fabulous, i have never seen this product before. Thanks for sharing guys!